This unique design for 40sqm hole-in-wall Chemists by JBM Projects is set to change the Australian Pharmacy Market by providing a convenient compact dispensing solution that maximises space and functionality through a fresh new approach. It’s a multibillion-dollar industry, employing close to 50,000 people nationwide, but Australia’s newest entrant to the pharmacy market is out to prove size does not matter. 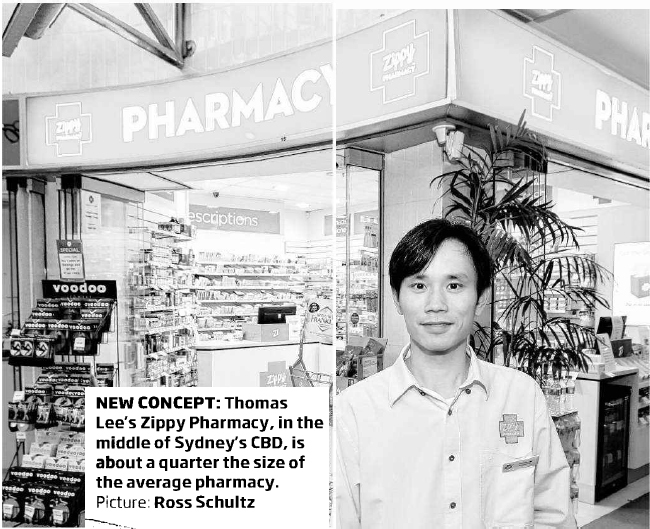 Zippy Pharmacy directors Stuart Ellis and Thomas Lee, both of Brisbane, have set up what’s believed to be one of the smallest pharmacies in the country, smack bang in the middle of Sydney’s central business district. About a quarter of the size of the average pharmacy, Zippy’s roughly 40sq m of floor space could almost be called a -hole-in-the-wall”, making up as little as 5 per cent of big box warehousestyle pharmacies. Brisbane builder Jason McRostie, of JBM Projects, said the idea was to design a pharmacy that maximised space, was functional and still looked fresh and inviting. “This design model will allow our client to roll out pharmacies quickly and cost effectively,” he said. Only six weeks old, Zippy makes no bones about what its market is, opening 7.30am to 6.30pm, Monday to Friday, to coincide with peak commute times in the CBD. Mr Ellis, a former director of Good Price Pharmacy and current owner of a few Chemist King outlets, said he spotted “a hole in the market” for pharmacies that only offered professional lines and some convenience items. “I’m a firm believer in ‘horses for courses’, where the style of pharmacy is tailored for certain situations. But, I also think that this might be a concept that really takes off in the future,” he said. That 20 per cent is made up of pharmacist-only medicines, pharmacy medicines and a small range of health-related products such as vitamins, supplements, sticking plasters, stockings, and other convenience lines. Mr Ellis said he was already scouting locations in Brisbane, hoping to open an outlet in the city within six months and in other capital cities around the country soon after.